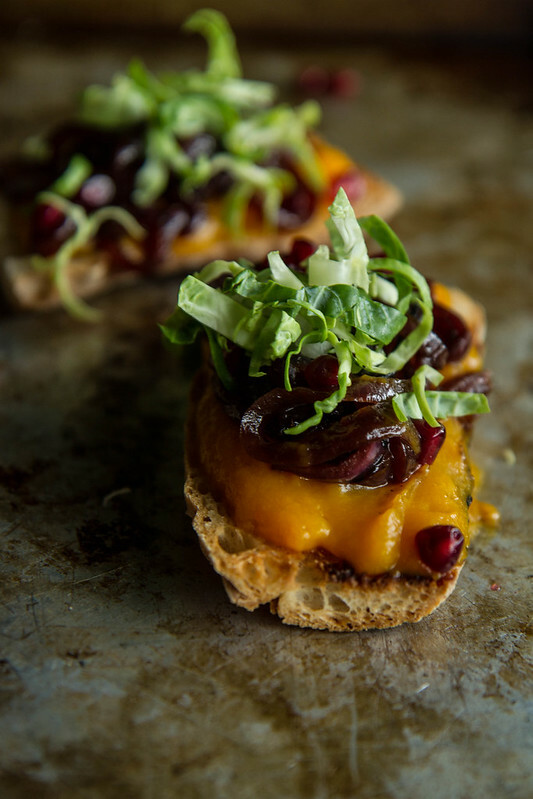 Toasty Tuesday commences with an absolutely amazing recipe for Butternut Squash and Caramelized Onion Crostini. These make for an absolutely delicious Holiday Appetizers that just happens to be vegan and gluten free (if you use gluten free/vegan baguette). The combination is out of the world with the buttery creamy squash puree that is reminiscent almost of what would happen if there was a layer of melted cheese. Then the sweet and sour of the onions which is always a magical dup. I do really enjoy the crunchy raw Brussels and the juicy little pops from the pomegranate seeds too. I think this is perfect for the Holidays for the color, the flavors and the make-ahead potential. You could do the puree and the onions days ahead of time and then bake the puree and onions on top of the toast at 350F until hot. Which means that these would work well for friends coming over on Halloween, for dinner parties or perfectly as a pre-Thanksgiving Appetizer! This seasonal combination of earthy, sweet and sour makes for perfect Holiday appetizers! In a medium pot bring the water and butternut squash soup to a simmer for about 10 minutes or until fork tender. When the squash is tender, pull the squash from the water with a slotted spoon and add to a blender. Puree on high until smooth and season to taste with kosher salt. Meanwhile, in a medium pan over medium heat, add the olive oil and the onions. Sprinkle with salt and sauté for 12-15 minutes over medium-low heat. Add the red wine, scraping all of the browned bits from the bottom of the pan and stirring while cooking for another 5 minutes until the pan is dry. Add the vinegar and the sugar and cook, stirring, for another 5 minutes. Season to taste with kosher salt. 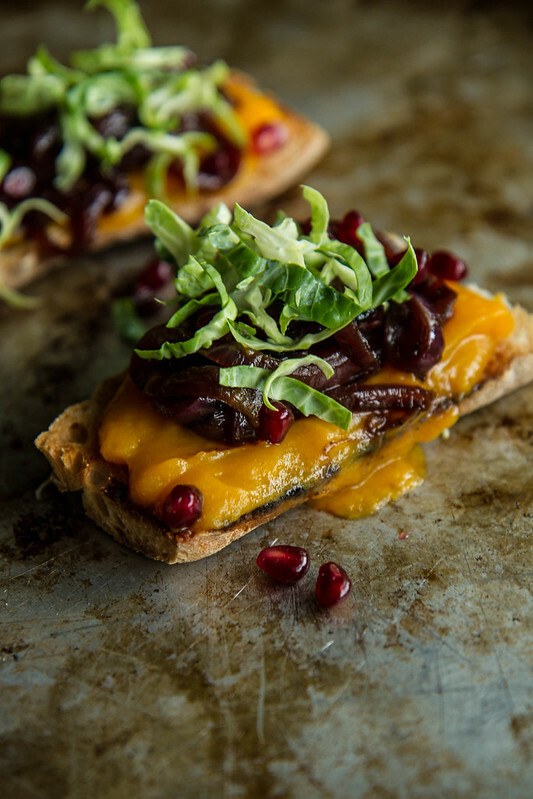 Slice and toast a baguette and slather with the butternut squash puree. 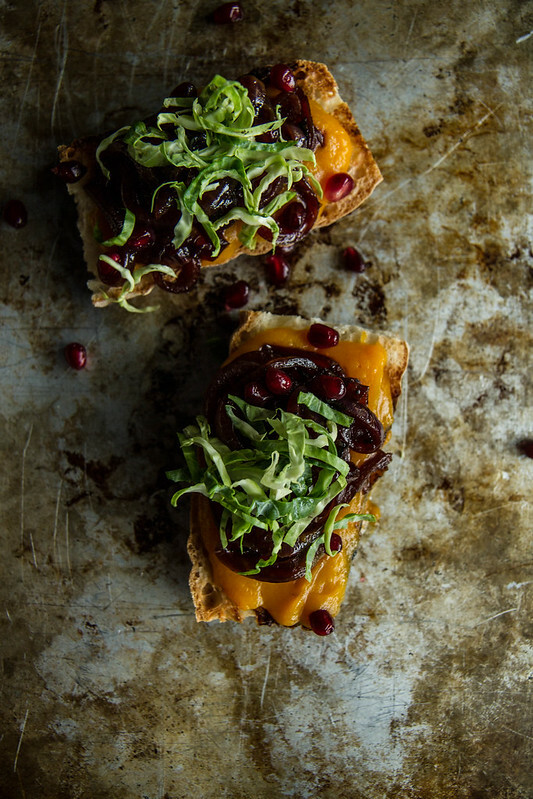 Pile some caramelized onions on top and then add a little bit of Brussels sprouts and a sprinkle of pomegranate seeds. Serve hot. Wow, that’s crazy how much that looks like cheese. This sounds like a perfect combo of fall foods. What a beautiful presentation. I’ve never thought of using brussel sprouts as a garnish…oh the possibilities! Yum! These would be a huge hit as an appetizer for the holidays in my house! I really love that butternut puree on there! These sound great! What a wildly creative and delicious recipe, great job!